BCJ is one of only 23 known nonprofit sliding scale organizations in the United States. Of that elite group, we are the only organization that also addresses social and community issues. To my knowledge, no local nonprofit gives more for less than we do. Last year our annual income was $15,000. With that small amount, we provided the community with 50 free legal clinics and provided legal representation and education to 125 people! BCJ subsidizes services to free legal clients at an average cost of $500.00 per client. Entering our 11th year, your donation will be a blessing. It is time for our staff to be paid. Our high school “Know Your Rights” program for graduating seniors began this year and we now focus on serving elders and their caretakers age 60 and above with preference to those who live in rural areas. We are inspired by Eve’s vision of redressing injustice inflicted on the disenfranchised or anyone who cannot afford the $350 an hour lawyer fees. We are ground breaking, forward thinking and client centered and for her important work and accomplishments, Executive Director and Founder of BCJ, atty. Eve Schatz was selected by Berkshire Magazine as one of 2016’s most influential, creative and dedicated people in Berkshire County. In celebration of Eve’s long time commitment and the many lives she has touched and in honor of our 10th year of operations, we ask you to give generously to the Berkshire Center for Justice. Please lend us your support today. Donations can be made by clicking the donation button above. The Berkshire Center for Justice (BCJ) is one of 23 known sliding scale nonprofit legal organizations in the country and the only one in that esteemed group with the perspective to offer a resourceful environment for those facing social and community challenges. BCJ’s is Berkshire County’s resource for weekly free legal clinics and we do so in collaboration with the Guthrie Center‘s Free Lunch Program. The Justice for Seniors Program has been funded in part with an Elder Services grant and BCJ will be addressing the legal needs of elders age 60 and above with verified low income status. Medicaid Planning, construction of end of life documents; consumer protection abuses, elder fraud; consumer disputes including debt and credit card charges; and other legal issues can be addressed. BCJ is specifically targeting 13 South Berkshire towns because transportation limitations can make it difficult for seniors to access services in Pittsfield. However, clients will be accepted from the whole county on a first come first serve basis. BCJ will offer two free legal clinics in South County in addition to its weekly free legal clinic at The Guthrie Center; a legal clinic on February 4, 2017 at the First United Methodist Church in Pittsfield, and one legal clinic in Adams. Intakes are free of charge and direct legal services will be charged at the much reduced rate of $50.00 per hour. We welcome clients of all races; ethnic identifications; disabilities; and sexual orientation. Telephone intakes can be arranged for shut-ins. Call 413-854-1955. 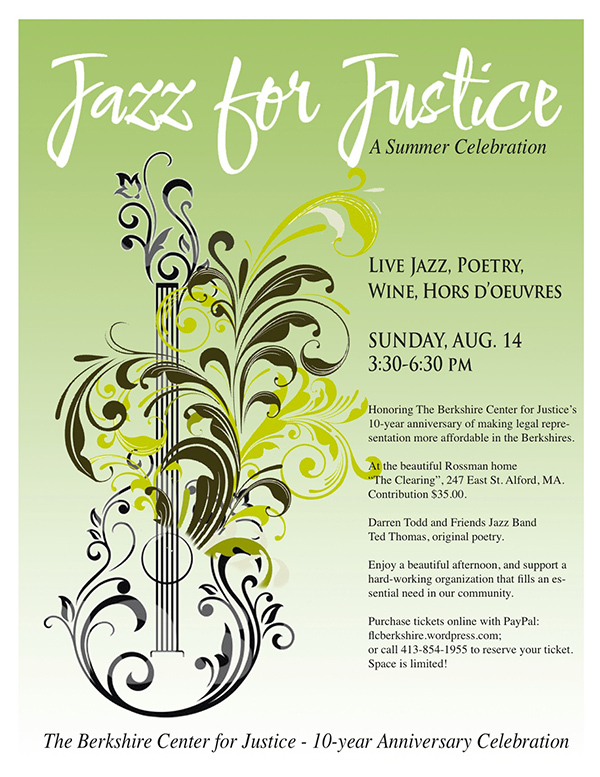 JAZZ FOR JUSTICE – 10th Year Anniversary Celebration!